Southampton, NJ (August 2, 2017) — A proposed gas pipeline through the Pinelands is an over-priced, oversized, ineffective answer to a problem that does not exist, a new report finds. “With the undeniable evidence against this pipeline boondoggle, the Pinelands Commission should withhold approval and the BPU must reconsider its faulty approval of the pipeline,” said Carleton Montgomery, executive director, Pinelands Preservation Alliance. The so-called Southern Reliability Link (SRL), approved by the state Board of Public Utilities (BPU) and under review by the Pinelands Commission, would cost more than $180 million and run through a 30-mile stretch of the Pinelands National Reserve, one of the nation’s most fragile environments. An analysis by energy markets consulting firm Skipping Stone, commissioned by the Pinelands Preservation Alliance, found that the BPU misunderstood the realities of how the gas supply system in this region functions when it approved SRL and failed to require New Jersey Natural Gas (NJNG) to conduct rigorous analyses of the system to justify the pipeline. “Had the BPU understood the bidirectional nature of the TETCO mainline supply, it would have found that SRL is neither financially prudent nor the least disruptive means of addressing the risk of gas supply interruption,” Skipping Stone said. BPU’s approval of the pipeline hinges on the claim that the company needs to respond to a hypothetical “single point of failure” disruption in service along the Texas Eastern Transmission Company (TETCO) pipeline that NJNG relies on to supply its customers. Skipping Stone’s analysis revealed that BPU failed to recognize that, because the TETCO line runs bidirectionally, adequate backup already exists and that even a massive failure in either direction along the mainline would not cut off supply to NJNG. The Skipping Stone analysis further found that the only significant gas supply failure scenario that could occur was not considered by BPU, but can be solved by a 100% effective and vastly less expensive fix far from the protected Pinelands area. The BPU should consider this alternative approach instead, the report says. Skipping Stone estimates the cost of the alternative to be between $26 million and $28 million. Skipping Stone’s scrutiny of the 9,096-mile TETCO line found no point along the mainline system that would meet the risk of a 50% or greater supply loss, which is BPU’s definition of what constitutes a disruption. In the event of a complete failure along the TETCO line, NJNG would still receive at least 96% of its supply. This level of reliability stems, in part, from the fact that the pipeline now runs bidirectionally, both west-to-east and east-to-west depending on need. The “upstream single point of failure” hypothesis on which BPU approved the pipeline assumed the TETCO supply only ran in one direction, so a failure “upstream” would cut off supply to NJNG. Because the TETCO line actually runs in both directions, no single failure in either direction would cut off supply to NJNG. When pipelines flow in more than one direction, outage areas can be bypassed so supply is not disrupted. The lone, short section of the TETCO system where a major failure could disrupt NJNG’s supply is called the Freehold Lateral, which connects the TETCO main line to the NJNG network. In the unlikely event of a failure on the Freehold Lateral, 100% of NJNG’s customers could be served by building a co-located 5.4-mile backup pipe. 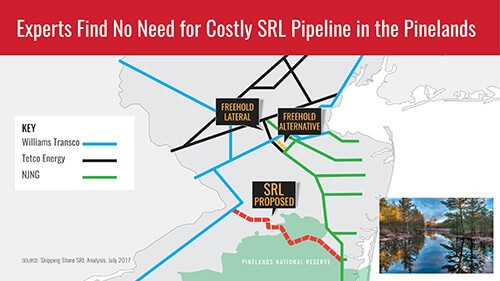 The $26 million to $28 million price tag would save NJNG customers more than $150 million in construction costs compared to the SRL pipeline through the Pinelands. In contrast, even if NJNG’s claim that a single failure on the TETCO line could eliminate its supply were accurate, the SRL pipeline would not be an effective antidote to such a failure, because SRL would only be able to make up for one-third of the lost capacity, leaving two-thirds of NJNG’s customers with no gas and a $180 million bill for the 30-mile pipeline. 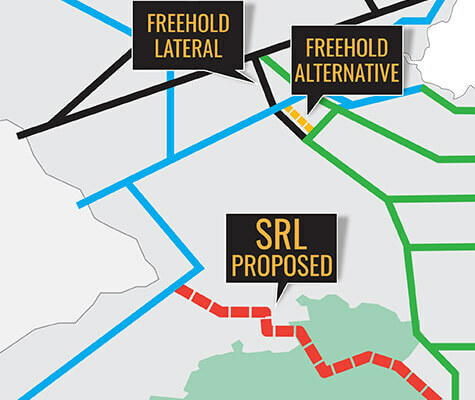 SRL, therefore, is an extremely expensive and very poorly-conceived proposal that would unnecessarily burden ratepayers and threaten the Pinelands National Reserve. Find the Skipping Stone report here.